Like most of the golf world, we’re extremely excited for the Augusta National Women’s Amateur. And we’re especially excited to see how a few familiar faces fare. We’ve seen many of the players in the field come through Pinehurst, most for the Women’s North & South Amateur, but also from U.S. Kids Golf. Here’s a quick glance at a handful of the most familiar, with a few lines from past stories we’ve written about them. In the championship match of the 115th Women’s North & South Amateur, Isabella Fierro missed just one fairway on Pinehurst No. 2. A week after the match, Sports Illustrated noted Fierro in its famed “Faces in the Crowd” feature. 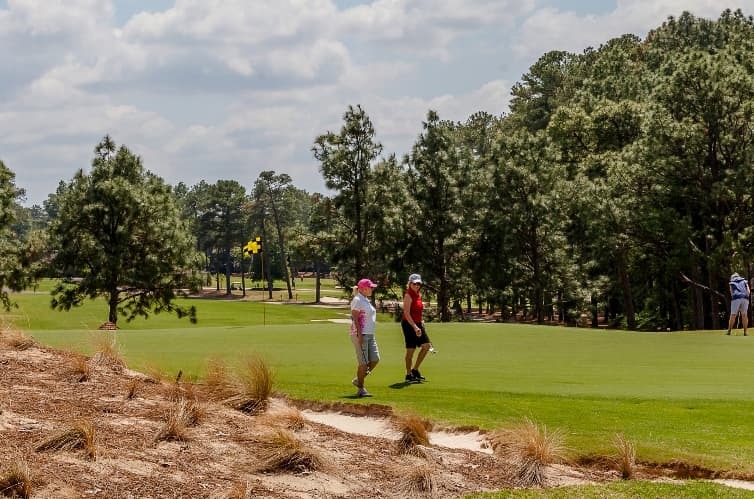 It’s long been said that Pinehurst No. 2 will reward the best of shots, but should a player make even the most minor of mistakes, the results could be devastating. Lau lost more than just the hole to Australian sensation Gabi Ruffels late in the championship match of the Women’s North & South Amateur. She lost her only lead to that point in the match, which began with her falling 3-down through the first three holes. But as Lau walked slowly to the 16th tee square in the match, she perked up a little. Lau blasted a soaring shot high and deep into the Carolina blue sky, the ball fading ever so slightly. When it landed on the green, there wasn’t so much applause as there were gasps. She belted her drive a staggering 275 yards – some 45 yards farther than Ruffels – leaving herself 193 yards to the front of the green and 215 to the pin of the par-5. Lau made the eagle to win the hole and regain a 1-up lead. And when she stoically made a testy 5-footer down the hill for par on 17, she had completed one of the more remarkable comebacks to beat Ruffels 2&1 and win the 116th Women’s North & South Amateur on No. 2 on Friday. A year ago – almost to the day – Anna Redding was fighting tears. She closed in style on 18 with another birdie for the second-round 68, this one from 10 feet, and walked off the course past the manual scoreboard as the leader in the clubhouse. The 2018 Women’s North & South manual leaderboard was missing one name – Anna Redding’s.